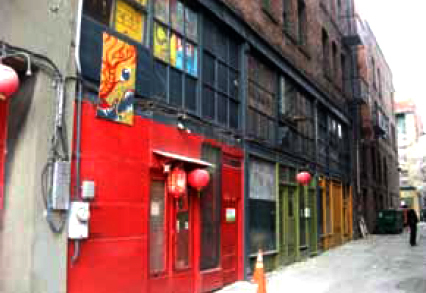 The Historic Alley Project is a community effort to bring life back into Canton and Maynard Alleys in Seattle’s Chinatown International District. The community has come together and identified physical improvements including lighting, paving, landscaping and public arts, that can transform the alleys into clean, safe, and fun places for residents, businesses, and pedestrians. • Help guide and implement alley improvements that will increase the alley’s aesthetic appeal, highlight their historical and cultural significance and promote greater usability for the community. • Enhance the alleys in ways that strengthen the local community and support local businesses. • Enhance the alleys to improve safety in the neighborhood. • Enable phased implementation by public and/or private funds. When safe and clean, alleys can serve as high quality open spaces and pedestrian and bicycle corridors. Alleys, as linear, narrow spaces, provide a more intimate and defined urban experience than regular streetscapes. They provide a distinct sense of enclosure; they are “rooms” within the larger urban framework. The process of invigorating the alleys must include ways to strengthen the neighborhood and build on its history. Physical improvements to Canton Alley and Maynard Alleys will enhance the pedestrian experience and strengthen connections through the Chinatown neighborhood. However, improving the alleys also requires community building and the mutual cooperation of residents and business owners that have a personal interest in seeing the alleys being used in a way that supports the quality of life in the neighborhood. Within these alleys lays tremendous potential to create places that are unique to Chinatown and that will improve the International District as a place to live, work and visit. For more information about this project, email us at historicalleyproject@gmail.com or call Ching Chan at (206) 838-8236. VOTE! Which Lantern Do You Want To See in Canton Alley?